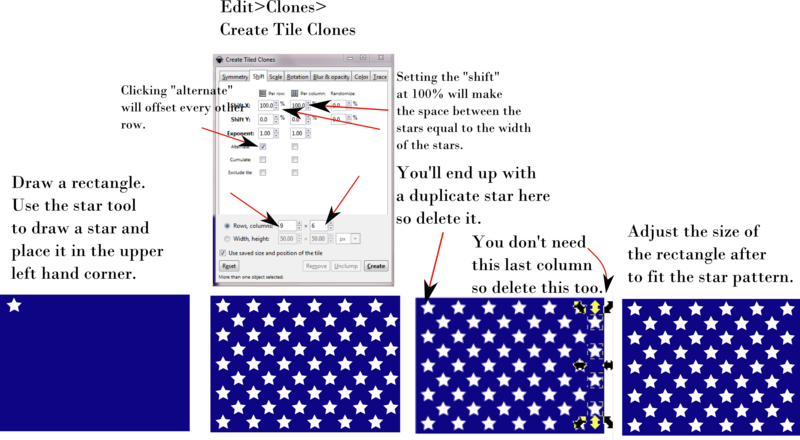 Here is a very easy tutorial that will show you how I distributed the stars on the American flag for my Independence Day illustration by using “tiled clones” in Inkscape. This is so cool and soooo easy! If you are having trouble reading it, click on the illustration to view it larger. I have more ideas for using tiled clones in Inkscape, and I can’t wait to try some more things with it. I can see that anyone that enjoys card making or scrapbooking could have tons of fun with this! If you’d like learn more about using Tiled Clones, papasueful has a great You Tube video on this topic. Go take a look.